Caron believes it has been a blessing and an honor to be a part of Dr. O'Connor's dental team since February 2016. She never grows tired of helping the patients feel more comfortable with their dental needs. She has worked for many dentists in her career and believes Dr. O'Connor's expertise surpasses them all. Outside of the office she enjoys gardening and teaching Sunday School to 3-5 year olds. Kendra is a Registered Dental Assistant; she has been working in the field since 2008 and has worked for Dr. O’Connor since April of 2013. Kendra attended Northwestern Michigan College where she became a dental assistant; she later received her California RDA license making her licensed in two states. She enjoys spending time with her husband, 7 year old step-son, and their 2 dogs. As a family they love to be outdoors participating in activities such as snowboarding, camping, fishing, and hiking; she also likes exercising her creative side, playing the piano, making jewelry and running her side business: the Hwy4Store. In November of 2018, Kendra and her husband will be welcoming their first child into the world. Kendra loves her family, dogs, and the great outdoors. Cathy attended Cabrillo College in Santa Cruz, CA where she graduated with an Associates of Science Degree in 1981 in Dental Hygiene. She also attended San Jose City College and received an Associates of Science Degree in Dental Assisting and worked as an R.D.A. and a C.D.A. for five years in San Jose prior to that. Cathy has 6 daughters and her husband has 3 daughters. They welcomed their 12th grandchild in November, 2017. Cathy and her husband recently moved from Santa Cruz County. She and her husband are tremendously enjoying their relocation to the Greenhorn Creek Area. Cathy enjoys their two dogs Otis and Macy, and their four cats: Harley, Elliott, Bella, and Simon. She also enjoys gardening, walks and hikes, quilting, and cooking. Lora lives in Jackson, CA with her husband, their three children, and their many furry family members. The community Lora lives in is important to her as she is grateful to have the ability to raise her three children in the lovely foothills of California. She appreciates the outdoors, traveling, and continuous learning. In addition to working for the awesome, Dr. O'connor, Lora is also a professor at Sacramento City College in the Dental Hygiene Department. In her practice of hygiene, she focuses on prevention, overall health, and to arrest any necessary concerns. 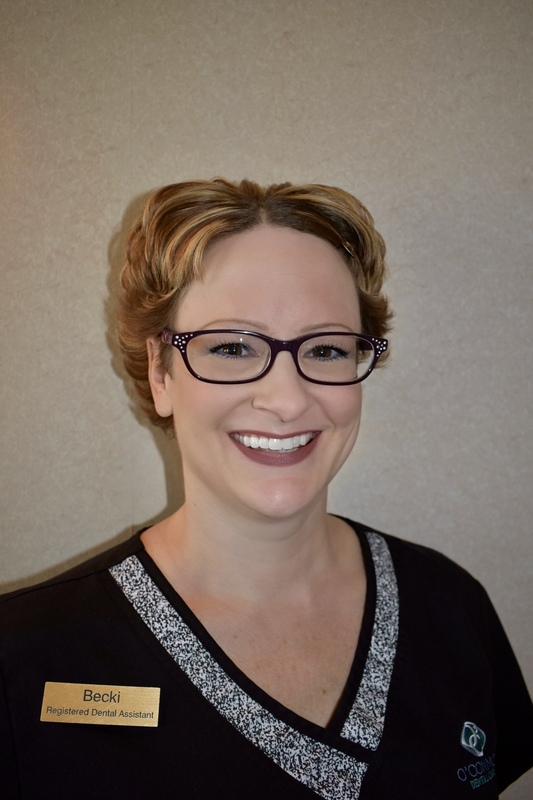 Through her 18 years of practicing dental hygiene, she feels confident in her skills and provides care with attention to detail to each individual patient. Lora looks forward to seeing you in our friendly and professional office in Murphy's! MaryLou attended UIC at Chicago Dental School where she graduated in 2005. She has been in dentistry for almost 30 years. She started as a dental assistant in Chicago and went back to school for her hygiene degree. She enjoys traveling and has lived in numerous cities. She loves meditating and being present in the moment. She has a daughter who currently lives in Chicago. MaryLou is of Puerto Rican descent and is fluent in Spanish. She is proud to work for Dr. O'connor where it feels like home. She is very passionate about dentistry and loves her patients. She is a big hugger! Vicki attended Foothill College in Los Altos, CA where she graduated in 1983 with an Associate of Science Degree in Dental Hygiene. She is a proud recipient of the “Golden Scaler Award” which is given to the top clinician of each class. She has been working in the dental field since 1984, beginning in the Bay Area working with several general dentists, and has worked alongside her husband Tim O’Connor since 1997. She has been happily married to Dr O’Connor since 1986, (they dated all through their dental schooling!). Their daughter Katie graduated the University of Oregon with a degree in Sports Marketing in June of 2015, and is currently working for the Giants Association in sales. They also have a yellow lab named Coda and two cats, Callie and Silver. Vicki enjoys exercising, boating, and cooking/entertaining for their friends and family. Becki graduated with honors from Andon College in 1994, and obtained her Registered Dental Assistant license shortly thereafter. She has been working for Dr. O’Connor since 2003. Becki and her husband Dale have five children: Marissa, Madison, Kali, Brandon, and Andria. Becki and her family enjoy gardening, fishing, and BBQing together. 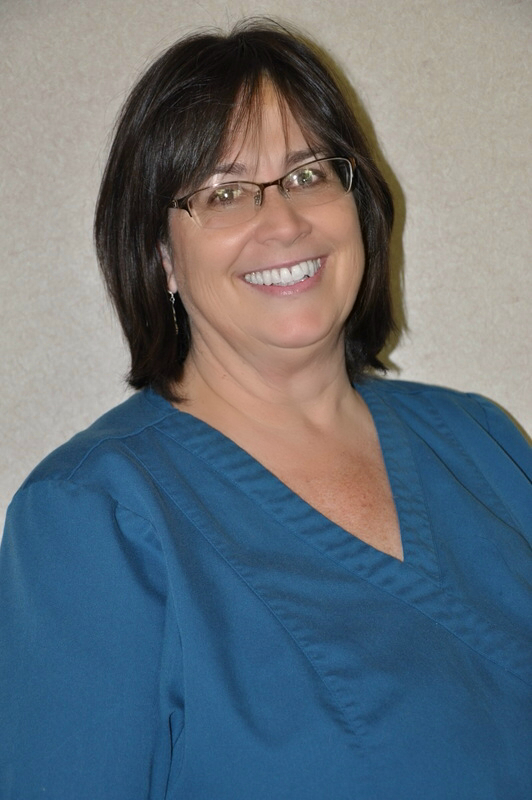 Donna is a Registered Dental Assistant and Office Coordinator. She was born in New Jersey and grew up in the Bay Area. She graduated from UC Berkeley in 1983, and attended College of Marin for their Dental Assisting Program. Donna has been in the Dental Field since 1985 and has been working for Dr. O’Connor since 2001. She has two daughters, Kailyn who graduated from Sonoma State University in May of 2015 and Lauren, who graduated from Chico State in May of 2018. Kailyn is currently working as a CNA, DA while applying to grad school. Lauren is currently working in HR in San Jose. Donna also has two dogs: Kirby a border collie, and Toby a golden retriever. In her spare time Donna enjoys reading, camping, scrapbooking, photography, gardening, being a mentor for the Calaveras Youth Mentoring Program, and spending time with her family and friends. Andrea is our front office asst. She joined the team in 2016. Andrea grew up in the Bay Area and moved to Murphys in 2003 when she and her family became patients of Dr. O'connor. Andrea and her husband Matt have five children: Christian age 21, Brendan age 19, Dominick age 15, Anthony age 13, and Gabriella age 10. Family is everything to Andrea and she is happiest when all of her kids are home together. Please contact our Murphys dental office with any questions or to schedule an appointment. We look forward to meeting you!